Ruthie Timman, eighth grader at Loveland Middle School, and Lilly Rohling, sophomore at Loveland High School, have earned the honor of contributing their designed rain barrels for the 7th Annual Rain Barrel Art Benefit Auction, held as part of “Party for the Planet” at the Cincinnati Zoo. Forty local artists – about half of them students and the other half professional or hobby artists – have revamped typical green, dull and drab rain barrels into creative and colorful accent pieces for the garden. All barrels will be on display at the zoo throughout the month of April, leading up to the last day of the silent auction on April 25. The Rain Barrel Art Project began as an initiative to promote the use of rain barrels, which help conserve water and save money. The project continues to educate citizens on environmental issues, including storm water runoff, watersheds and water conservation. Art teachers around town have taken it on as an annual project for their students, who are often passionate about the environment. Party for the Planet is held in celebration of Earth Day, which falls on Monday, April 22. Proceeds from the rain barrel auction will be used to further environmental education and awareness. 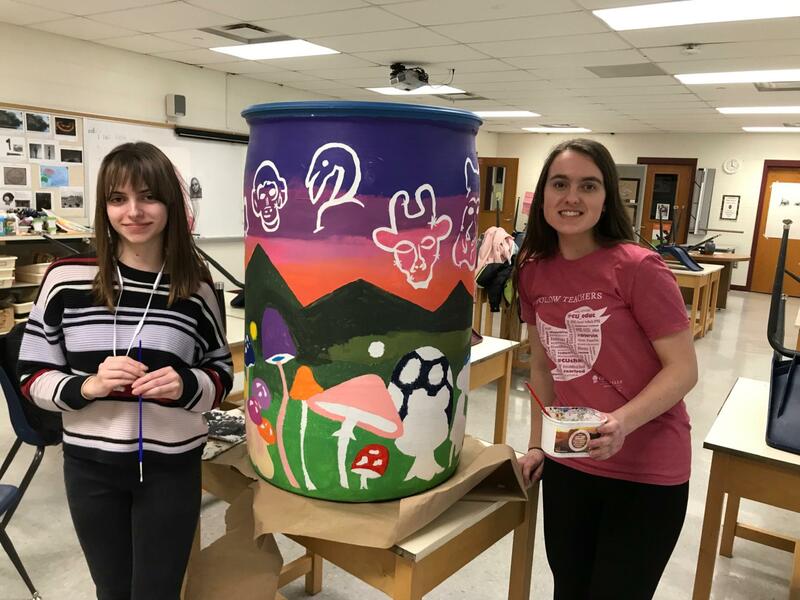 Photo caption: Lilly Rohling (on the left) and Rachel Noe, both members of the Loveland High School Art Club, worked together to paint Lilly’s winning design on a plan rain barrel. Photo caption 2: Ruthie Timman (on the right) involved family, friends, her science teacher Catherine Rudisell, and classmates as she worked on her rain barrel project. Here she is with her friend A.J. Dahlquist.